So, you know how when people become inspired by the life or actions of a character on TV or in film, there are always those naysayers who combat the feelings of the newly inspired with, “Oh, but that’s just a movie. Real life isn’t like that”? Even those who have been inspired will find ways around achieving what they’ve seen others do. “I know it’s only fiction, but…” This preface to whatever we might feel bolstered to bring to life is like a safety net for when we don’t. It’s like saying, “I know this is stupid, but…” Then if it really is stupid, and someone else calls us on it, we can say that yeah, we knew it wouldn’t work out, however much we really thought it might and really wished it would. So what? So what if the stories we love and want to live are scripted? Is it really so cliché to point out that every day we’re writing the very lines of our own stories? In National Novel Writing Month we learn that writing our stories unscripted is what truly breathes life into them. If we stick to an outline and any preconceived scenes or actions or dialog, then the characters and their choices seem stiff. They might even feel too perfect. That’s when they don’t feel real. So who cares if you read about someone who broke out of her everyday blah by being determined enough to shoot for something greater? Okay, so it’s just a book, but maybe someday your life will be a book too, a fiction based on real life. The lines in that book or screenplay will be scripted, and they might not be yours, but it’s not really the dialog of our lives that matters anyway. It’s the actions. Fridays at the online writing group I belong to are set aside for writing flash fiction. Every Friday at 9 a.m. a writing challenge is posted on the Flash Friday blog for Shenandoah Valley Writers, and participants have twelve hours to come up with something before the deadline at 9 p.m. Then the judging begins. Last Friday was the first time I participated. I have known for a while what flash fiction is, though I never tried writing it, except for a six word story one time. 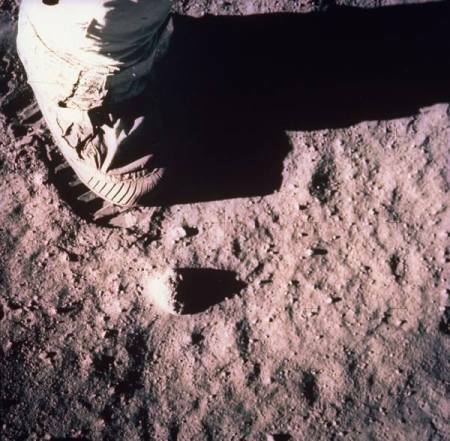 Last week’s challenge was to write a 50-word story based on an uncaptioned photo of astronaut Buzz Aldrin’s foot taking one small step for man. In the moment when I viewed it on my Droid Razr in a darkened parking lot outside my office building before heading home from work, I did not recognize the photo. To me it looked like someone in hiking boots stepping into mud. Flash fiction, I learned somewhere, can be anywhere from six words to thousands. There are even flash novels out there somewhere. What binds all these stories together in their own genre, however, is that they are succinct; they are brief. Every sentence, every word even, is important. Flash fiction doesn’t contain long paragraphs of description simply for the beauty of writing. Not that there’s anything wrong with such paragraphs, in other books. That’s just not what flash fiction is. So I drove home last Friday, recording ideas for my flash fiction into the digital recorder I use for work, and when I stopped at Martins for groceries, I jotted down ideas into paragraph form. I was racing the clock by that point. By 9 p.m., my entry had to be posted in the comments section of the SVW Flash Friday blog, and it then was nearing 8 p.m.
At home, though, the writing went quickly, and by 8:20 or so I had a finished version. It was pretty good, I thought, and I even dared to think it great. I had read over the six or seven entries to the previous week’s contest and thought my 50-word story easily a contender to be this week’s winner. On my first try, I’d produced a masterpiece — one giant leap for writerkind. And I patted myself on the back for being someone who scores a hundred percent without even studying…much. Then I saw how many other people entered the contest. I’ll give you a hint: It wasn’t six. There were twenty-one entries, plus one by the moderator herself. Not only did I not win, I wasn’t even one of the two runners up. Suddenly, my story seemed a lot more like sixty percent. I’m sure my story is fine for what it is, a first try, but I definitely learned a lesson in humility Saturday after I read over all the other entries, most of which did use a theme of space exploration, whereas mine was about mud. When the results came out, I wasn’t much surprised. Sad, maybe, but also encouraged. It was my first try. That’s why there’s practice. Mud. I’ve embraced the name. I’m more like mud than they realized. It’s squishy; it won’t be brushed aside like dust. When someone steps on it, it leaves an impression. It also sticks to shoes. They don’t know they take it along with them. Unlike dust, mud has a life. Last year I wrote my New Year’s themed blog post about the importance of not forgetting the past in favor of a better future. It seemed to me that people so easily hope to forget the past as the clock rolls over from December into January. A clean slate is much more attractive than a book of mistakes and regrets that wrote the early pages of our adulthoods — maybe even our childhoods. I have no such words for this year’s first blog. In fact, I have very few words on any subject at all. To those of you who have been checking my blog and wondering when I might return, I apologize for again abandoning my post for two months. When last I left you I was writing another novel. Then I guess everything just got crazy, and the blog fell to the background. Over the weeks leading up to now, I have thought about writing. Then every Thursday would pass me by again. I could list the reasons and excuses, but it’s a new year. Instead, I’m moving on. I don’t feel new like so many people would hope to feel in the new year. But I do feel as if I have good opportunities waiting for me to find them in the future. Like many others, I’m currently on a healthy eating/exercise plan, though I’m not stressing over the boundaries of said plan. I also have intentions of finishing my first novel this year…the one I had hoped to submit to the Amazon Breakthrough Novel Awards this month, which, yeah, isn’t going to happen. But I’m much closer to my goal than I was last year at this time. This past fall, I rewrote five whole chapters, and just last week I scrapped and began rewriting another two. Then, just this evening, I picked up my clarinet for the first time in a good long while. Every couple of years I attempt to begin playing again, having given up the daily routine of it more than twelve years ago. Yet tonight, I practiced Bach … from memory. Of course I stumbled over notes, but I found them all, and the second try was even better. I’ve fallen from a size 3 reed to a 2, but I’m playing. So I’m making these recent attempts my metaphor for the new year. It doesn’t matter how long it’s been since you’ve written anything creatively, or how long it’s been since you’ve eaten broccoli, or how long it’s been since you picked up your guitar or sat down to the piano or tried to recall high school Russian. All that matters is you’re doing it now. And that you keep doing it, for as long as it means something to you.